199th Pick – Who Is This Quarterback? You are at:Home»Seattle Seahawks»199th Pick – Who Is This Quarterback? Luke Falk was the 199th pick in the NFL draft, and in my eyes he’s an absolute steal for the Tennessee Titans. Should the Marcus Mariota project fail, he’d be a great replacement. I don’t expect Falk to take Mariota’s job over the offseason, but it’s not like anyone saw Russell Wilson coming. All three of these players were taken in the draft, and if you’re reading this as a college football fan you probably already know who’s who. As you can see, they’re comparable. Quarterbacks B and C have been vaunted as the next Donovan McNabb or Trent Green. The other? I’ve read a comparison to Kirk Cousins, but besides that Player A has been compared to Mike Glennon and another website suggested for said player to gain some weight. Note how all of the players above weigh about the same. Another twenty pounds and all of a sudden we’re evaluating potential linebackers instead of quarterbacks. How ridiculous! Player A is an all-time PAC-12 player. He’s the career leader in completions, passing yards, and ranked with the 16th highest passing efficiency rating in the conference. 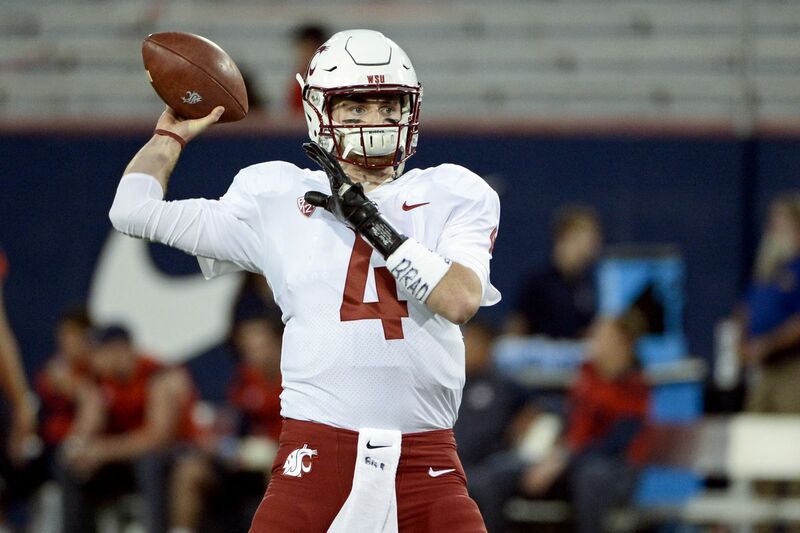 His name is Luke Falk, and he had an amazing career with the Washington State Cougars. Player B is Josh Rosen, and Player C is Sam Darnold. The table gives an interesting take on the narratives behind these quarterbacks. Falk was derided for having played in an air raid system so terrible that it apparently produces more touchdowns than standard sets. While Rosen and Darnold threw for 18 and 15 passing touchdowns this past season in the red zone respectively, Luke Falk tossed 26. The WSU quarterback is proficient at finishing drives and is situationally adept in short field situations. Falk’s yards per attempt is lower than Rosen’s or Darnold’s, but he’s been more accurate and is near invincible in the red zone. The problem with Falk’s low yards per attempt rate isn’t even that much of a big deal here. The running game was so bad at WSU, that they had to turn Luke Falk’s arm into the team’s running game. Plus, the NFL demands that quarterbacks are proficient at the dink and dunk game, which Falk had absolutely perfected. When Rosen and Darnold get into the league, their offensive coordinators will coach them to dump the ball against prolific defenses. So long yards per attempt! Not to mention that Falk’s wins at the collegiate level are really impressive as well, perhaps more so than Darnold’s. Falk has won against USC, Stanford, and Oregon. Darnold has a couple of great wins over Washington and Penn State, but Josh Rosen hasn’t beat anybody. Heck even Jared Goff never beat anybody decent, as he went 0-9 against Stanford, UCLA, and USC. I know that evaluating quarterbacks is a fifty-fifty flip of the quarter, but this shouldn’t be that hard right? How could a PAC-12 monster fall to pick 199? Falk landed in a good spot. The Tennessee Titans bring a new coaching staff that is guided by Matt LaFleur on the offensive side of the ball. LaFleur had been quarterbacks coach for Matt Ryan in Atlanta before leading the Los Angeles Rams offense this past season. This could be a boon for Falk’s development for years to come.